Over the past 20 years, researchers have increasingly accepted the fact that different types of experiences can alter the structure and function of the brain over time. In an article published in the Journal of Cognitive Psychology, APS Fellows Judith Kroll (Pennsylvania State University) and Ellen Bialystok (York University) highlight bilingualism as one experience that can have a profound impact on lifelong neural and cognitive development and functioning. The failure to integrate research examining the cognitive and linguistic consequences of bilingualism has led to the perception that the effects of bilingualism are somewhat specific and isolated, when, in truth, it causes profound changes to the way the brain functions. Unfortunately, several methodological issues have impeded research into bilingualism’s influence on cognitive and neural behavior and development. 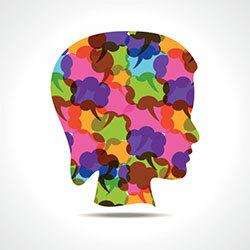 Bilingualism research has taken a componential perspective, studying the structural and cognitive influences of bilingualism by breaking them down into a few measurable components. This approach has led to an overly simplistic understanding of the broadly based reorganization that occurs in the bilingual mind, as well as to a failure to recognize the many contextual components that lead to complex changes in brain structure and function. Researchers have also adopted a dichotomous view of bilingualism, categorizing people as either monolingual or bilingual. But bilingualism is not a categorical variable. Bilinguals vary multidimensionally in social, cognitive, educational, and linguistic ways. The influence of bilingualism, therefore, needs be studied in the context of a dynamically interacting system, rather than as a categorical assignment. In spite of these issues, advances have been made in our understanding of how bilingualism shapes cognitive and neural functioning. Research examining language processing in bilinguals has shown that information about both languages is activated whenever a bilingual person listens, reads, or plans to speak one language. This cross-language activation is seen in both novice and highly skilled bilinguals and is seen at multiple levels of language processing — from lexicon to phonology to grammar. Cognitive investigations of bilingualism have indicated that bilinguals inhibit the language they are not currently using during word recognition and production. Surprisingly, these studies have indicated that it is the native language that tends to be inhibited rather than the second, nonnative language, suggesting that the native language actually changes to accommodate the second language. The control systems used in inhibiting and switching between languages are those generally used in selective-attention and nonverbal executive-control tasks, Bilingualism leads to more efficient use of these systems over time, which may explain why bilinguals show advantages over monolinguals in nonlanguage tasks that utilize these processes. These consequences of bilingual experience are often more pronounced in older adults as they manifest when ageing has caused the brain to become less efficient and rich in resources. While there is still much to learn about how bilingualism affects the mind and brain, the effects are clearly not specific and isolated. They are wide ranging, resulting in neural, cognitive, and linguistic changes that last a lifetime. Kroll, J. F., & Bialystok, E. (2014.) Understanding the consequences of bilingualism for language processing and cognition. Journal of Cognitive Psychology, 23(5), 497-514. Speaking more than one language also enables greater understanding of other cultures and points of view. It forms a solid foundation for compassion, empathy and a desire to embrace the whole human race. It is its own foreign student exchange program. While math and science have their place, it is in the humanities that peace is cradled. Fascinating. Does American English and Texan English count? In my current daily life, I have to used at least three language at work place and my job require me to multitasking at all time. In an occasion, one colleague came to my desk to ask for a lock code (code is c309x). I was on a phone call at the time so I pick a pen and wrote (x309c) on the piece of paper. Is there any explanation? And does the brain work different between a person who speak two languages and another person who speak five languages? Because I do speak five languages including two dialect fluently.